The RPG genre is one with so much room to incorporate new experiences. Taking the traditional building blocks of turn-based battles, character progression and story driven adventures, one would expect that so many different narratives woule emerge out of that. And yet, what we mostly see are fantasy games inspired by Knights in shining armor and rampaging dragons. That is not to say that there hasn’t been innovation in the setting of RPGs, but there is a clear majority. There are games who dared to break from the norm and became cult classics. Earthbound is the greatest example of an RPG set in an “odd” setting that became a legend. Several games had tried to imitate its success but more fall short than get closer to hitting the mark. YIIK is one of many games who try to revolutionize, but instead fall flat on executing their brilliant ideas. YIIK: A postmodern RPG is as you can imagine, an RPG. You play as Alex, a college grad who witnessed a women getting kidnapped at an elevator and sets out to uncover the secret behind her disappearance, little did he know that things were going to get even weirder. If I were to try to describe YIIK being as simple as possible, I would say that YIIK is your traditional turn-based RPG but with an incredible amount of quick time events (QTEs). 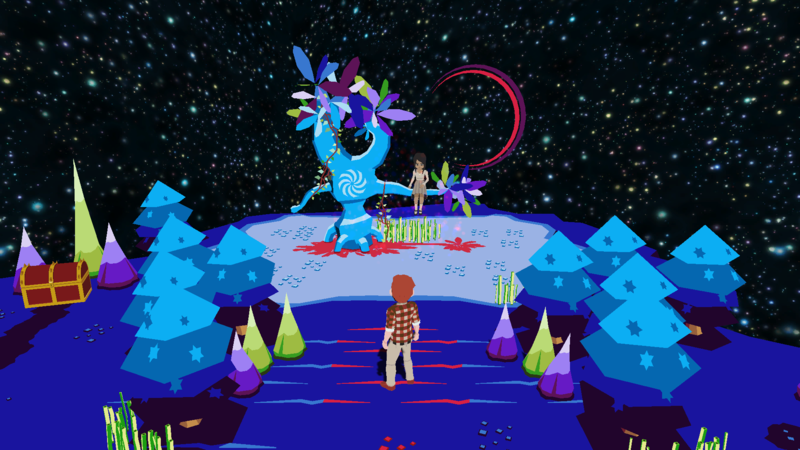 QTEs are always pretty divisive, but YIIK makes it a point to make them unique rather than relying on the old “press a specific button at a specific time”, it creates a unique event for every single action in the game, both offensive and defensive. For example, when Alex does a regular attack, you have a spinning record where you must press the button on the right sections of the track. Using Vella’s banish skill will make you play a Zelda-like mini game where you have to defeat a mini-boss in order to succeed. Getting attacked has you press a button at the right time of a gauge to block or even dodge an attack. Heck, even running has you playing a runner-like mini-game that is very similar to the offline dinosaur run game from google chrome. As much as we love mini-games, I’m not really exaggerating when I say every single action involves one, and this is where we begin to see how intrusive they truly are. The fact that these mini-games are not precisely quick and the staggering amount that are involved in a single random fight is the ultimate pace breaker. Quick fights which shouldn’t take long start to drag on because of the duration of these QTEs, are there isn’t a way to disable them or even sabotage yourself to cut them short. When discussing in-battle mini-games I feel like it is worth to bring in a game which was wildly successful in its implementation of them: Undertale. Every attack in Undertale also has an associated mini-game, with enemy attacks being bullet hell patterns. Out of these two game one is an outstanding game while the other is average at best, so what is the difference? There are 2 major differences between them: length and fun. The attack animations in Undertale are extremely quick and its transition is seamless. 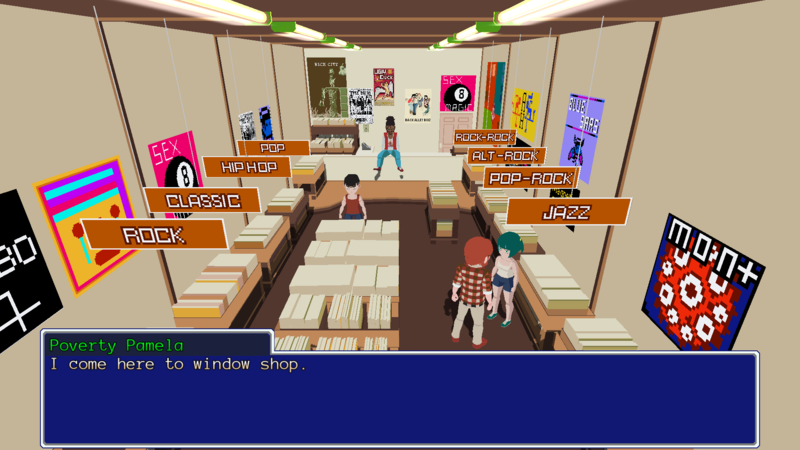 YIIK feature more sluggish transitions that take more than double the time while also littering with random text messaged. The other main difference is that Undertale’s mini-games stay fun throughout the game, while YIIK makes them a chore. Throughout the game, you will deal with different patterns from the enemies in Undertale, which have you be on your toes, whereas in YIIK you can even close your eyes and just memorize the timing of that same QTE you’ve done for the 100th time. Sluggishness isn’t exclusive to battle and QTEs, and perhaps it is one of the most negative aspects of YIIK. RPG games don’t distinguish themselves for being quick experiences, but they provide some level of swiftness to the player in many ways like travelling, navigating menus and even skipping dialogue. The pace in YIIK is extremely slow with text boxes taking longer than they should, conversations dragging longer and even the K button refusing to cooperate. I would actually like to know if other people have this same issue. For me the K button is very unresponsive when trying to interact with objects. I typically need to press K multiple times for it to interact with objects. If I were to hazard a guess, I would say the delay is related to Alex decelerating from its run speed and interact prompts being declined until he is at 0 speed. Another very interesting inclusion to the genre is the Mind gate. The Mind gate is the place where you go and level up. Yes, this means that you don’t level up naturally, but rather have to go to a phone to enter the mind gate and level up using experience points. The main advantage of the mind gate is that you have 100% control over how you want to level up your character. Each level will present you with 4 door with number ranging from .5 to 2 from my experience. This variety lets you allocate the 2 point door to the stat you choose like STR and .5 to a less desirable one for you like DEF. 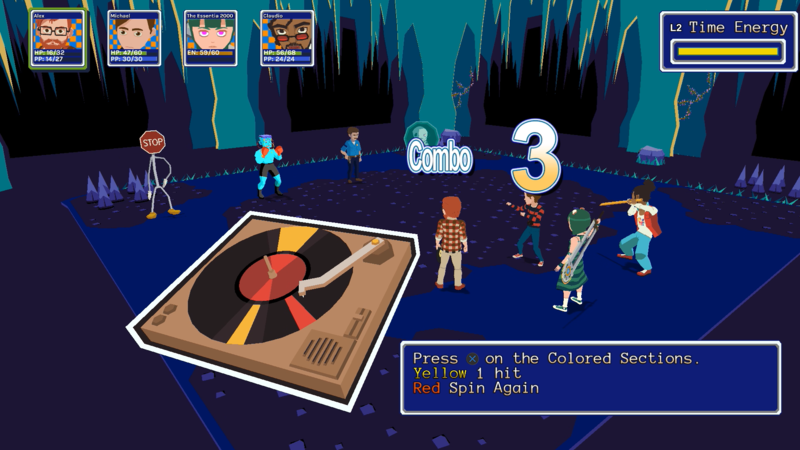 Many games have tried diverse ways or randomizing this aspect like Mario & Luigi and its roulette system, but YIIK’s customizable approach is definitely for the best. I actually like the mind gate, but I absolutely loathe how sluggish it feels, a quality it shares with many other elements of the game. As yet another complete lack of respect for the player’s time, you need to WALK into each individual door, set the stat sign, and then enter the door. All separated by slow dialogue windows and all taking longer than it should. Now repeat the process 4x and you can see how much time is spent here. It gets even worse if you have enough EXP to level up multiple times. Fortunately the Krow can pick them for you and save you the time, so I always chose to do that. A couple of my earlier complaints can be traced to one single flaw, which is that it seems the game was created by amateur designers. Don’t get me wrong, I think a lot of the ideas within the game are really good, but they are all terribly executed. There seems to be a complete disregard for trying to make it a fun game for players or even respecting their time. At times I would say that there a very conscious effort to recreate the quirkiness of Earthbound, but shooting too high just left many other aspects of the game unpolished to an unplayable degree. An example of this can be found on the camera angles. While the perspective is generally 3/4ths, it actually changes perspective depending to where you are. This is pretty useful when approaching south borders, because the change into a more top down perspective allows you to scan for goodies, but other than that YIIK will present you with uncalled changes of perspective. RPGs NEED exploration, but I found the camera just obscured and confused my perspective. Comparing it to the angles of the original PS release of Resident Evil would be a disservice to Capcom. One of the high points of YIIK was supposed to be its out-of-this-world story. There are some very interesting events and an overall force which is threatening the world, but it all goes down the drain thanks to the worse story element: Alex. As a protagonist, Alex is supposed to be connected to you and make you live the story as your own. Instead, you quickly find out he is just another insufferable college graduate. Any interesting piece of dialogue is quickly turned down by his sarcastic remarks and generally unlikeable comments. Perhaps the worst part comes with his inner monologues. It seems they were trying to go for a more narrative approach akin to books dissecting a situation in great detail. More often than not, however, the monologue becomes boring and even pointless to the story at hand. A lot of the important parts would have been better told through flashbacks, and we would at least be a part of Alex’s past. All throughout my time with YIIK I felt like I was only going forward with the hopes of YIIK becoming a very good game. A lot of games feature less than stellar beginnings, so I hoped my patience would bear fruits, but instead I found my time being disrespected by YIIK even more. I never felt captivated and as I kept playing, I hated every aspect more and more. Novelty wore off, old problems aggravated and the game never took me anywhere significant. It was at this time that I decided that YIIK wasn’t worth it and many fellow reviewers seem to agree. As I said there are many great ideas within this game. Many of the ingredients of success were present, but their execution left a sour taste. Frankly I think many aspects can be polished and improved, but with those changes it would just make it feel closer to average.